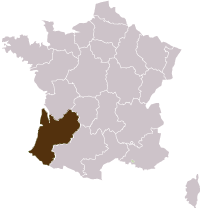 This is the final stage in France before crossing the Pyrenees and reach Spain. 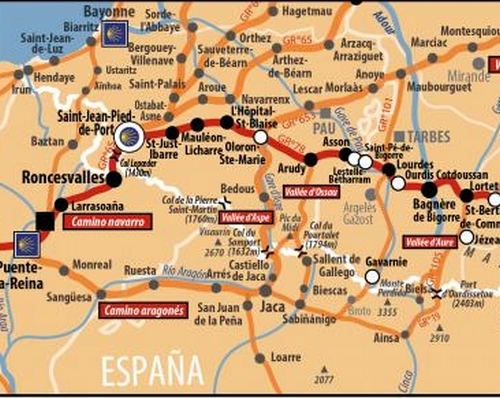 The Piemont Route route also called the Pyrenean Foothill Way links the so fervent city of Lourdes to the authentic St-Jean-Pied-de-Port and winds its way on the foothills of the Pyrenees, starts in Bearn and ends in the Basque Country, both rich cultural places. Afternoon arrival in Lourdes. A high place of Pilgrimage, with the Domain and the town's 35 place of cult. Dinner and night in a hotel close to the Sanctuary. Lourdes-Lestelle Betharram – 16 km (10 miles) – 4 hour walk. A shorter walk to have the time to walk underneath the arches of St Pee de Bigorre, before taking a break in the coolness of the Betharram caves, reaching finally the imposing Chapel of Notre Dame de Betharram.Dinner and night in a hotel near the caves. Today's walk leads you into the foothills of the Pyrenees mountain range passing through cultivated fields and numerous villages like St Martin d’Asson with its baroque St James evocation chapel, or Ste Colome and its 16th and 17th century sculpted lintel houses. The walk ends in Arudy where you can admire the 16th century marble church, the Ossau Valley house and ancient abbey. Dinner and night in a hotel in Arudy. The Pyrenees range, postcard scenery and the Gave River, a mountain torrent from where came the rocks used in the stone walls of the traditional houses. Close to the village of Busy discover a glacial erratic block left there by the Ossau Glacier. The last ascent of the day leads to the typical mountain city of Oloron Ste Marie with its ancient bridge and 12th century church.Dinner and night in a hotel in Oloron. Your path today arrives in Moumour with its 13th to 16th century Oloron Bishop Castle, next heading off to the village of Orin discovering its peculiar St Martin porch. Among corn fields we continue reaching Hôpital St Blaise and its Greek-cross-shaped Church. Dinner in a restaurant and night in a Guest House. Here starts the real mountain. Just before climbing up to Napale Pass (539m), have a break at the Odiarp Church on the river's edge. Your descent takes you into the large and green Bidouze valley and the hamlet of St Just Ibarre. Dinner and night in a Guest House in St Just Ibarre. St Just Ibarre - Gamia Pass -St Jean Pied de Port – 24 km (14,5 miles) -6 h30 walk.+/-350 m.
You can admire and observe the vultures hovering over your head and down slowly towards the castle Apat flanked by four round towers. After passing through St Jean le Vieux you reach St Jean Pied de Port, the first step of the "Way" in France where most of the routes converge. Dinner and night in Saint Jean. 2 or 3 star hotels, bed & breakfasts or Guest Houses (depending upon availability). Private bathrooms. Half board from dinner day 1 to breakfast day 9. The trip to the start and from the end of your trip. Visits. Drinks. Travel insurance. Everything else that is not listed under "Price includes". Luggage transfer- A road book and a map. Ends in : St Jean-Pied-de-Port. Access : Lourdes train station.